What are the x-y dimensions on the movement? Should the start of the cut on the X on the left start almost 4 inches over from the rail? I know I don't want to run it into the base but it seems like there is a lot left over. Re: how big is the cutting area, where should it start? after grabbing a ruler its actually closer to 2.5 inches from the rail but it still leaves room to move over. Last night I tried my first project that involved tiling and I was surprised to see that the 2nd tile started over about an inch further then the first. Is there a way to move the first one over that extra inch as well? My latest project is to make a case for a first day cover that is signed by 11, 500 home run hitting hall of famers. Like on the switch plate I first painted the plexi and then with the diamond tip engraver went over the letters. I set it up for 6 x 8 tiles with a 1/4" overlap. For some reason it moved the larger letters up what looks to be about a 1/4", is that because of the overlap? I assume it would be better to try and split up the engraving so the tiling does not go through it somehow or is there a better way to clamp it down to ensure its in the perfect location? Like I said this was the first time I have dug out the tiling jig so its all new learning for me, thanks for taking the time and sharing. So--I would recommend not using any overlap for your tiling. In my experience it tends to just lead to more obvious defects than no overlap at all. Also--overlap would require a non-standard jig. There isn't really any easy way to do tiles that aren't 6" wide with the basic handibot jig. Here in the shop--one of the guys has a setup where he just bolts down a straight edge with an inch scale on it, there's a tick mark on the front of his handibot and he just slides it up and down the scale when tiling. This would let you get unusual size tiles--and the weight of the handibot should be sufficient for holding it in place while you cut. Can you share the CRv file? Edited 1 time(s). Last edit at 01/10/2019 06:42PM by Brian Owen, ShopBot. probably through an email or something but I am not sure, never done it before. maybe, never done it before. email? You should be able to attach it to your post in the forum. does that look ok? At one point I was having issues where when I did the 3d rendering it was showing things were off a little so I saved all the programs again and made sure it was marking the correct areas and it seemed to correct it. The more I think about it there should be some way to cut the shape out and then either by using the mounting holes to move/hold it where I need it, or again by cutting out the outline in another board to then mount it down at the specific places I need it held down at to do the correct engraving. I just am not sure how to do it exactly, probably need to test it out a few times I guess. Maybe I will use some cardboard at first to see if it will engrave it correctly rather then spoiling acrylic. 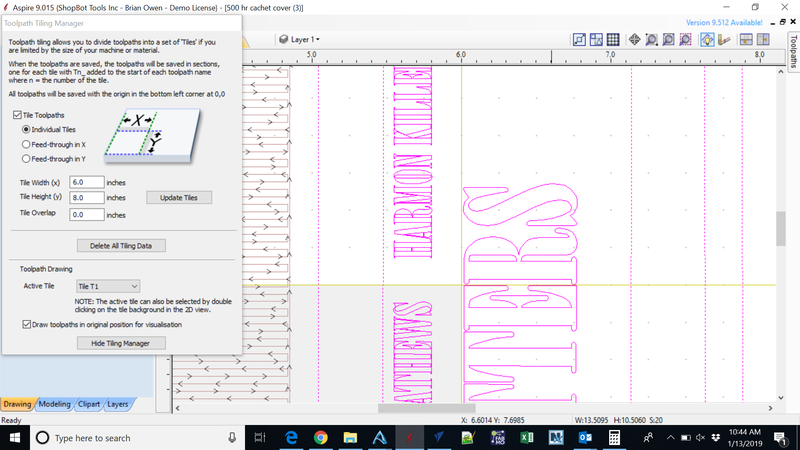 Take a look at the attached photo--this is what I'd recommend...switching back to 6x8 sized tiles--and shifting the parts a little bit in your layout so that none of the big letters are split across tile divisions. Carving letters in two tiles is always going to be tricky because any little misalignment is going to be visible and there isn't any way to fix it with a little bit of sanding. Profiles, on the other hand, are pretty easy and if there's a little mark where the tile break was made--you can sand it away easily. Thanks for the help I will give that a try. I have a couple of other smaller ideas I think I will try first to get the idea of tiling before going into this one.